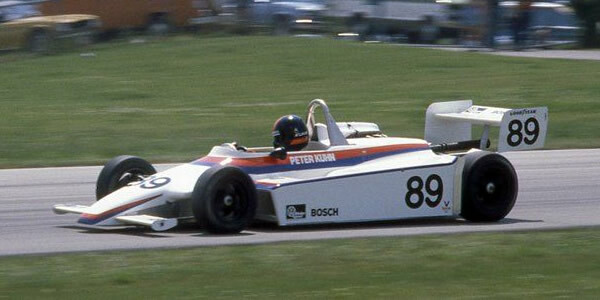 Kiwi Dave McMillan, who had won a number of races in his domestic series with an antique Ralt RT1, moved to the US for 1980 and secured a drive with David Psachie's team, driving the latest Ralt RT5/80. After second places in the first two races, he won at Watkins Glen and Mid-Ohio in July to lead the championship, but then his funding ran out and he was dropped by Psachie. He was forced to convert his old RT1 to FSV specification, but a nasty accident at Minnesota ended his title chances. This opened the door for Peter Kuhn, who had started the season in a Bill Scott Racing Ralt RT1/78, but acquired a new Ralt RT5/80 after the first few races and won four races in succession in July and August. He then scored enough top-4 placings in the remaining races to hold off Josele Garza in the second Psachie RT5/80. The Ralt RT5/80 was the dominant car of 1980, and the March 80Vs were overwhelmed. Two American cars are worthy of note. Former Coyote and Wildcat Indycar designer Bill Riley produced the Protofab Riley which dominated the Michigan event before being disqualified because the car's skirts were too wide. The rather more legal Autoresearch was designed by Dave Bruns, later the Swift DB1 designer, and built by Don Edmunds, who had built the early Indy Lightnings. Ray Lipper and Bruns himself were the main drivers, and Bruns scored two second places at the end of the season. Other race winners in 1980 included Bob Earl, who underlined his ability by appearing at two races and winning both, one in the Arciero Gibbs Racing Ralt RT1/79, and the other in the ex-McMillan Psachie Racing RT5/80; and 18-year-old Al Unser Jr who also only started two races, but dominated the final race of the season, also in that Psachie Ralt RT5. McMillan's old car won the last three races of the season with different drivers, Indycar racer Herm Johnson guest-driving it to victory at Watkins Glen. This was the first season of the combined SCCA/USAC sanction, with the races split between the old Gold Cup road racing circuits and the Mini Indy oval tracks. FSV was definitely seen as junior to Formula Atlantic at this stage but the series were effectively on separate ladders: FSV drivers aiming for oval competition and ultimately the Indy 500, and Atlantic drivers having their sights set on the top of road racing, namely F1. See also Gordon Kirby's review in Autosport 8 Jan 1981 p26. The results here have been compiled by Chris Townsend using US magazines such as Sports Car and Racecar , the new name of Formula magazine. Some results are still incomplete: some of the minor placings at Brainerd, Ontario, Michigan, Watkins Glen and Phoenix are unknown, we have no entry numbers for Michigan, Watkins Glen or Phoenix, and qualifying positions are missing or incomplete at Charlotte, both Watkins Glen races, Riverside and Phoenix. Entry lists are also sought. Ralt chassis records allow a lot of the RT1s and RT5s to be identified, as do Argo records for the JM2 and JM4, and Lola for the T324 and T620. We also have some knowledge of March's 79V and 80V sales, but we have very little on the US constructors such as Autoresearch, Protofab Riley, Wheeler and Zink. Second hand cars can be tricky as it was rare for US race reports to mention former owners of second-hand cars, unlike the regular habit of European reporters. Other identifications have been gleaned from SCCA logbooks for the cars that have survived. Autoweek classified ads sometimes give ownership and chassis number clues. March, Autoresearch and Protofab factory records may yet be discovered. Email Allen (allen@oldracingcars.com) with any further additions, corrections or comments.